Critics say it looks like a giant washing line — and have pegged it as a waste of 350 000 GBP. 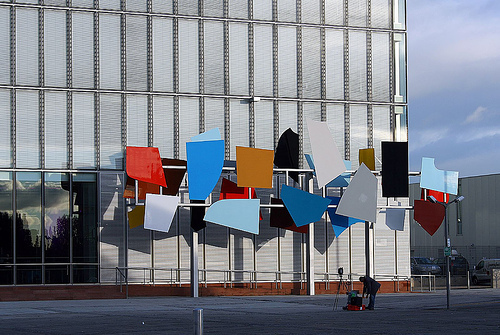 The 18 x 9 m sculpture outside the BBC’s new Glasgow headquarters at Pacific Quay is the city’s most expensive piece of public art. Posted by clype in Glasgow, Science, Statistics. The ‘Carbon Footprint‘ or CO2 emissions accounts for 70 per cent of our ‘Ecological Footprint‘, which is a combination of all things we do that draws on natural resources and is measured in global hectares per person (gha). House prices have continued to rise faster in Scotland than in the rest of the UK, new research has shown. House prices fell by 0.6 per cent during September 2007 — the biggest drop since December 2006 — and helped pull ‘The Annual House Price Inflation’ down to 10.7 per cent ( its lowest level since May 2007), say Britain’s biggest mortgage lender, ‘Halifax‘.